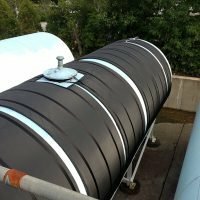 What is a Large Diameter Tank Heater? Large tank heaters are designed with 2 Heating Jackets. 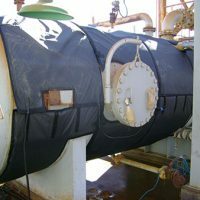 These fabric Heating Jackets provide insulation to the storage tank as well as provide heat. When the circumference of a tank gets too large, it is easier to install two Heating Jackets, each designed to cover 180 degrees of a tank. Together, the two heating jackets are securely strapped, drawing the heating systems snug to the tank. Silicon Valley Clean Water is a water resource recovery facility in California that works to recycle wastewater. The company uses polyethylene tanks to store caustic fluid, and when it’s too cold the caustic fluid crystalizes. 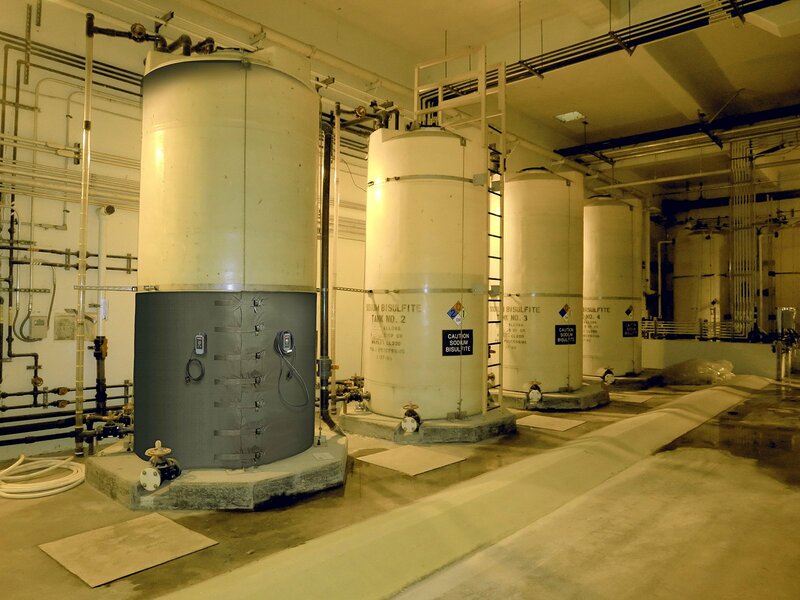 To keep an accurate temperature in the tanks, we were contracted to create large diameter industrial tank heaters that wrapped around the tanks. Using two heating jackets to form a single heater for the caustic fluid tanks actually holds several advantages that make it the optimal design. When tanks are greater than 84” in diameter, installing and handling the heating jacket can be difficult. By designing the industrial water tank heater to have two Heating Jackets, it makes it much easier to install. The industrial heat blankets cinch to each other and this ensures the Heating Jackets are snug to the tank. Single large tank heaters that are designed without two separate parts often struggle to securely fit the surface area of a tank and therefore won’t be able to maintain an accurate temperature. The power supply was on this project was 120v and 15 amps, to provide adequate power each heater has its own temperature controller and power supply. Custom Heaters & Research has successfully designed this style of an industrial water tank heater for several companies where tanks are as large as 16’ in diameter. Whether you have a large diameter tank that operates indoors or outdoors, our team can design an industrial heater that will maintain the desired temperature. If you want to learn more about our Large Tank Heating Jackets, call us on 1-845-758-0700 or submit a custom tank heater request form.